Coventry were one of my favourite teams in childhood, certainly of the top flight clubs. I first followed the football leagues avidly in the early eighties, when Coventry avoiding the drop on the last Saturday of the season was an annual event, like the boat race. They’d been in the top flight for years, and seemed to have some voodoo hold on it, despite tantalisingly petering on the edge of division 2 all the time. As a young boy Coventry City was synonymous with good football, action and excitement. Despite the lack of terraces (alleged, actually was there some kind of weird mud-bank standing going on in the mid/late eighties), Highfield Road looked like a great venue for football on TV. I liked it when Coventry were on Match of the Day, because it would usually be them against some big gun with the opportunity of an upset. One of my favourite MoTDs of all time was their 4-0 drubbing of the unbeatable Liverpool with the moustachioed Terry Gibson getting a hat-trick. That was pure magic as was their 3-2 FA Cup Final win over Spurs in 1987 – the penultimate interesting cup final. Did you know that in the 1981/2 season Southampton drew 5-5 with Coventry, and then in the 1983/4 season beat them 8-2! How often do you see 10 goal matches now? The early eighties saw some classic whopping scorelines. Do you remember Doncaster 7 Reading 5 in 1982/3? That hasn’t been topped since. QPR 5 Newcastle 5 in 1984/5? I think QPR were 5-3 down with a few minutes left. Sorry, I digress. 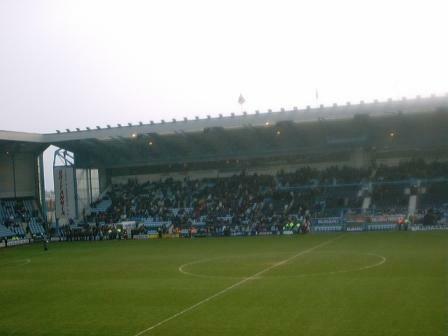 I was lucky to be able to go to Highfield Road with Brighton, as eventually their paths crossed thanks to Coventry’s eventual relegation in May 2001, ending their 34 year run in the top flight, and Brighton’s amazing back to back Championships. 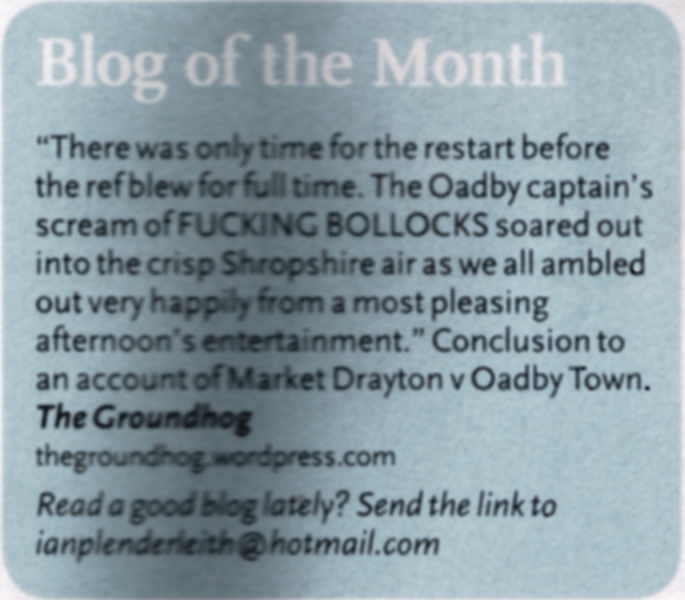 Coventry’s relegation was surreal to me. They were one of a handful of top-flight stalwarts who it seemed weren’t ‘allowed’ to get relegated, along with Arsenal, Liverpool, Everton and Southampton. (I’m not sure this isn’t actually true in the case of Everton, cf. 1993/4). 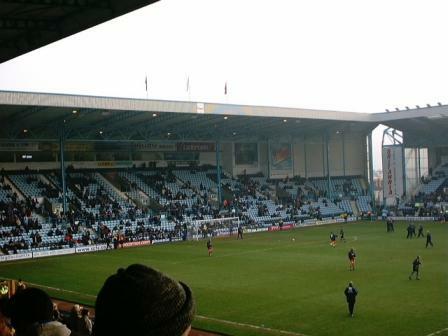 Coventry spent 106 years at their Highfield Road venue from 1899-2005. The club was founded a little earlier in 1883 by employees of Singers Cycle firm and was known as Singers until 1898. A great quiz question that has Coventry City as its answer is Which is the only team to have played in the Premiership and Divisions 1,2,3,4, 3 South and 3 North? It’s a great question that quickly finds the real football stattos whittling the answer down to a number of possibles in the midlands area. I met my brother at Coventry station for my only visit there, somewhat ruffled from my initiation ceremony known as the Coventry ring road, a road which demands otherworldy driving skills as you are flung, as if from a catapult, into five lanes of fast busy traffic and exiting requires a crab-like move over several lanes in the space of fifty yards at high speed. It certainly wakes you up from the monotony of the M6. The ground, like most of the old ones, was situated in the city centre in an area of quite dense housing. The atmosphere around the ground was good, the typical convergence from all four compass points of mostly blokes, spilling out from alleyways, cutting through ginnels and side streets between terraced housing. Men, clad in sky blue popping out their front doors at ten to three. Programme sellers and hot dog vendors on street corners – the traditional Saturday afternnon fare. It was a lot smaller inside than I imagined it to be from seeing it on TV. It was nicely enclosed with the stands close to the pitch and the corners were quite well filled, though not wrapped around fully. This is the long side. The picture quality is a bit poor. The away fans were opposite this on the other long side nearest to the double tiered behind-the-goal home section. 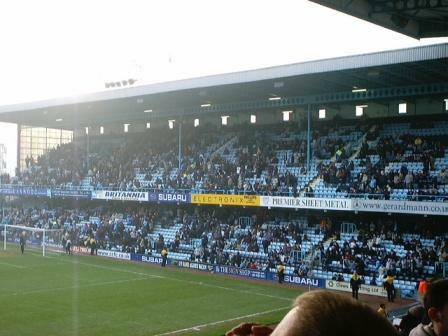 This was my favourite stand at Highfield Road. It reminded me of Loftus road a lot. That’s it I’m afraid for the photos. I only really took photos of these three stands – there are more but they’re pretty much identical to the above. Highfield Road was a cracking community ground – it’s a shame they felt they had to move. I’m only disappointed that the scoreline didn’t match up to the atmosphere provided by the ground. Though 0-0 was definitely a result for us rather than them! This entry was posted in Groundhopping, Travelog. Bookmark the permalink. The great thing about Highfield Road was that visiting teams always got plenty of tickets. I recall a decent Christmas/New Year match being won 4-3 by Coventry City. Spurs had to wear City’s change strip that day due to a clash. On another occasion this fixture clashed with the Warwickshire beer festival held at the university in the city centre. We felt obliged to visit the event before and after the match! The only other time this happened was when I went to Meadowbank Thistle. On that occasion the beer fest was in the ground!! The new place is dire. Instead of an open terrace it has a Tesco. Ugh. Thanks for the memories of Highfield Road. Alas, I never got to see it pre-development, except on MoTD. It did look v interesting at times. That it was still a good haunt (comparitively, nowadays!) even after development shows what character it must’ve had. Yes, the Ricoh is another Stepford Stadium, I’m afraid.